Cover Reveal: DANGEROUS DEPTHS by Karen Amanda Hooper!! 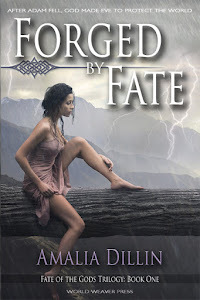 Today I present you with a *~magical~* cover reveal! DANGEROUS DEPTHS by Karen Amanda Hooper! Karen is, incidentally, a very dear friend of mine. 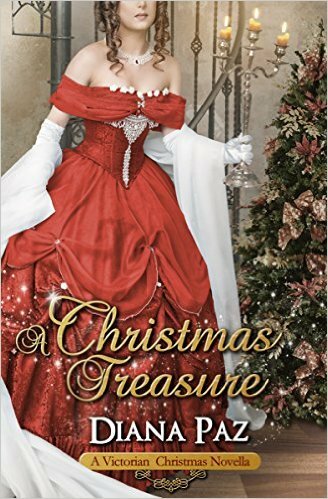 Her books are all beautifully written, filled with romance, adventure, and as you can guess... magic! 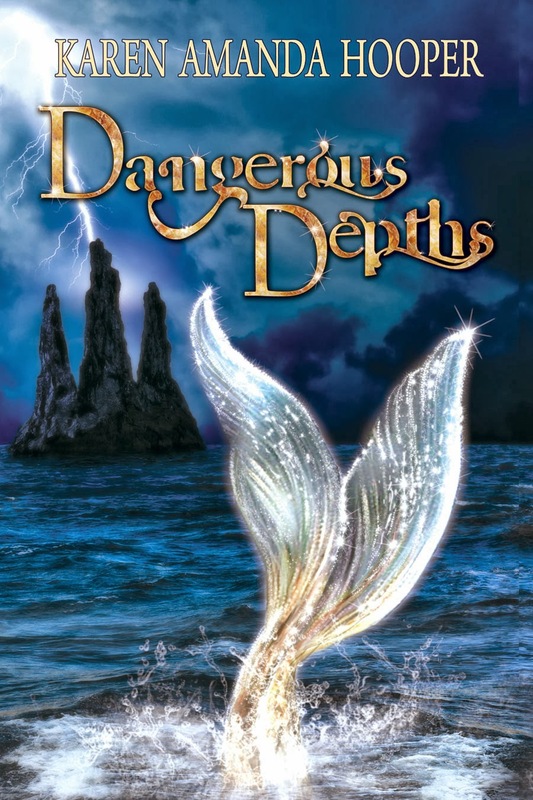 DANGEROUS DEPTHS is the sequel to one of my favorite books, TANGLED TIDES, which is all about mermaids, selkies, and undersea awesomeness. 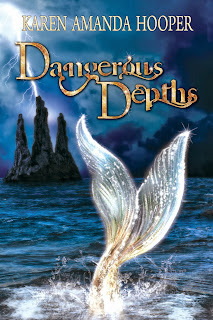 Without further ado, allow me to present the gorgeous cover of DANGEROUS DEPTHS by Karen Amanda Hooper... <3! RAFFLECOPTER GIVEAWAY: One winner will receive a signed paperback of Tangled Tides (1st edition, Rhemalda Publishing version) and an ebook of Dangerous Depths on its release day. Open internationally! Contest ends Monday, September 23, 2013.
a Rafflecopter giveaway SEA MONSTER MEMOIRS Rafflecopter DOUBLE Giveaway! It's true. 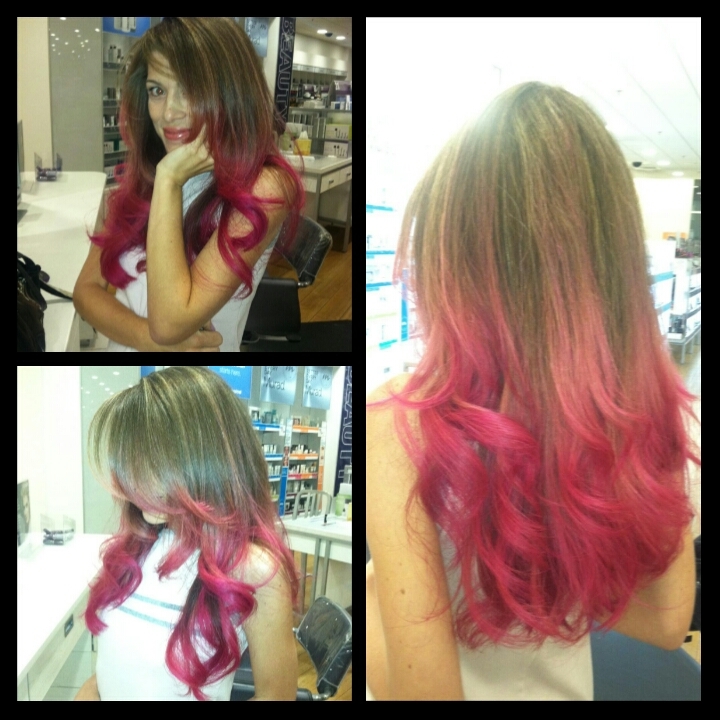 My new pink hair has granted me superhuman abilities. THREE of them, actually! Will I use them for good or for evil? That's yet to be determined, but I'm trying out both Evil Laugh and Solemn Heroic Nod to keep my options open. I knowwww, superpowers go in and out of style; will I still be happy I have them in forty years when spandex tights reveal more unpleasantness than anyone wants to see? Well, I've already gone ahead and acquired my new powers so I'm just going to embrace it! Superpower infusion! AKA, pink ombre hair... which, I had never heard of before! I'm a writer... I don't exactly get out much. But! I trust her implicitly in all things having to do with style, beauty, and superhuman abilities (she is an EXPERT). Doesn't she look trustworthy? OR LIKE SWEENEY TODD?!!! I love you, Christina! xxooxxoo! Where was I... that's right, my awesome new hair, avec superpowers! From my understanding, the intense static created by brushing out dry hair lends itself well to converting craniums into LADs, which then enables THUNDERBOLT ABILITIES! I could hardly wait to try it out! 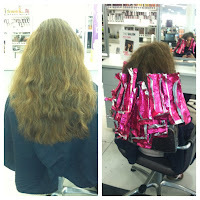 By the time my sister had finished brushing, my hair was not only audibly and visibly crackling with static electricity, but it was extremely large! Superpowers were headed my way, I just KNEW it. 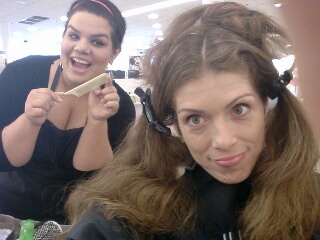 Next came the good part: teasing my hair UP toward my scalp. I became immediately and exponentially poofier. At one point my hair encircled my entire head like a true lion's mane. I remember the worried look I caught in the mirror at my sister's salon, but she immediately assured me that this was all going as intended. "You want beast powers in addition to lightning capabilities, don't you?" HECK YES I DO! So at this point she advised me to roar, and boom. Lioness powers. I sheathed my claws and smiled at her with my new fangs (she was very pleased) and waited for her to finalize the LAD process. 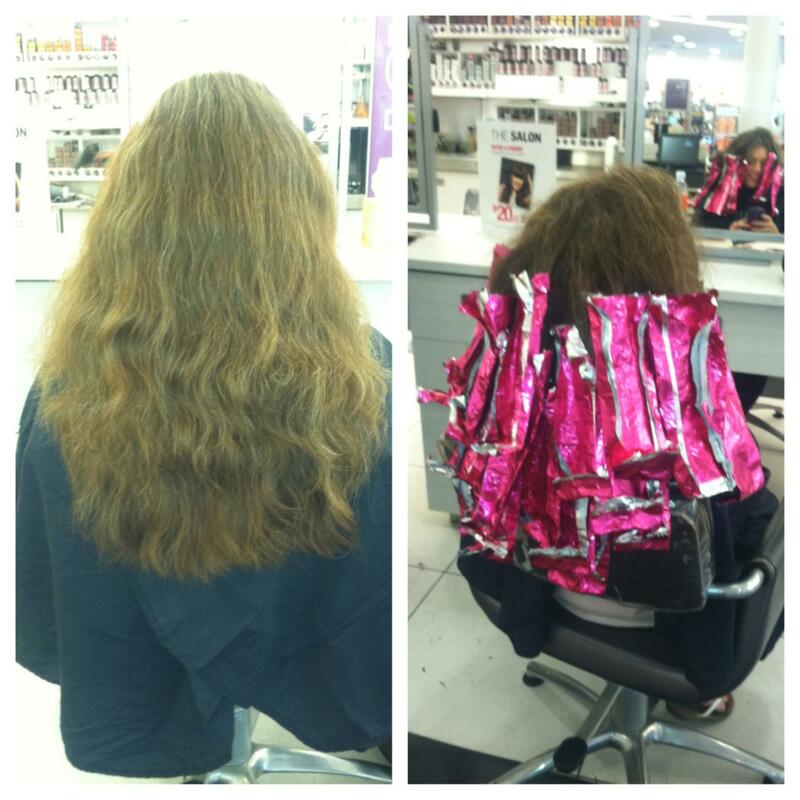 This was done by separating my hair into sections and applying metal strips to my hair. My sister guided then guided me outside where I was promptly struck by lighting. I accidentally took on lion-form from the shock, and boy did she laugh. "If I had a nickel for every time that happened..." I blushed so hard, but after a few seconds I morphed back into my human form and we went back to the salon for the last step in my superpower infusion: fire casting abilities. In order to gain true fire casting skills, I had to be lit on fire (obviously; even I knew that). Some might wonder if I ought to have been worried when my sister approached with a blow torch in hand, but remember, I trust her COMPLETELY and besides, I had already been struck by lightning so I was feeling pretty good about everything. The heat was surprisingly comfortable. As flames licked away at my hair, my sister had me practice shooting lightning across the room. My aim wasn't the greatest, but my sister is so encouraging. "Awesome! Next time avoid anyone you don't want to kill or injure. You have SO got this, girl!!!" At last, my sister led me to the fire-dousing containment unit, where she warned me that from now on I would have to use cold water to wash my hair. She promised that having superpower-infused pink ombre hair would be well worth it, and really, at this point I had already committed so what choice did I have? My head was engulfed in flames. As awesome as that look is short-term, it was bound to be problematic if I didn't get it taken care of. So, I was rinsed down with icy water. When that cold water hit my scalp I growled--I couldn't help it! I managed not to claw my sister to pieces... that would have been so rude of me, but now that I have this beast-side I don't always remember about manners! My sister is really sweet, and she said most people understand if I apologize and let them know I'm new to morphing. Anyway, my sister was right! 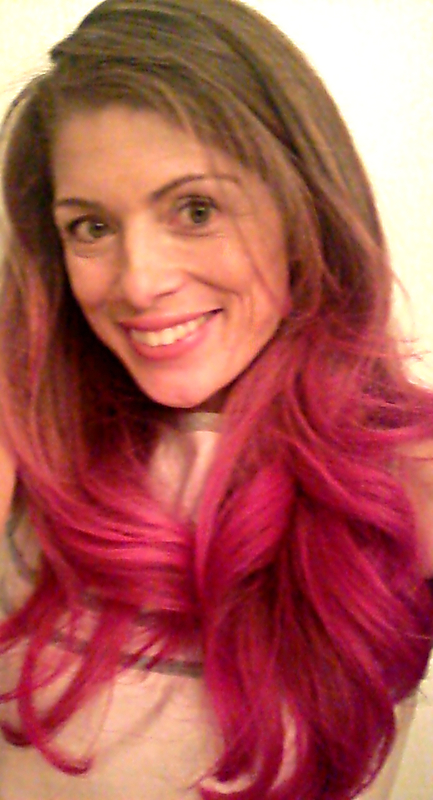 Having superpower-infused pink hair is absolutely worth having to use cold water to wash my hair from now on! Shooting lightning and flames from my palms, AND transforming into a fierce lion? Awesome.